Scary zombie-like fingers try to enter a room from behind a closed door. Kid running through house hallway slow motion. 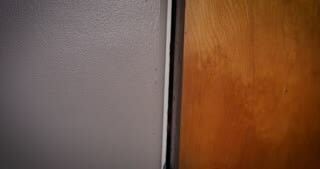 Sliding from behind a door while a young boy run from bright room to another on hallway in house. Scary zombie-like fingers try to enter a room from behind a closed door. Old film look stylized treatment. 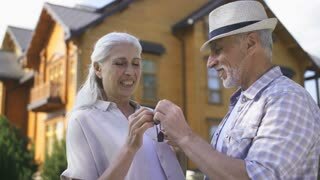 Close-up portrait of attractive senior aged couple in front of new house standing and showing door key to camera while smiling. Rack focus from elderly wife and husband to house keys while shaking.